Compliance with regulations coming from governments and from industry associations is a big problem for our clients – whatever the industry. In working with several banks over the years, we’ve become adept at identifying gaps and designing solutions for one of the most wide-reaching regulations for such organizations: the Bank Secrecy Act – aka “BSA”. The BSA was passed by the US Congress nearly 50 years ago. It stipulates reporting and auditing that banks must perform on themselves and their customers to identify potential money laundering, terrorist financing, and other criminal financial activities. Its requirements have only grown over the years – especially since the 2001 terrorist attacks in the US – when the federal government heightened requirements on banks and financial institutions to “partner” with it in fighting terrorists and their financial networks. Unlike fraud – where a bank or its customers are the actual victims of monetary loss – the BSA compliance efforts are somewhat thankless in that mainly the federal government and various agencies benefit, though the burden of compliance falls on each individual bank. Nonetheless – BSA is perhaps the most critical set of regulations with which banks must comply. A bank can be blocked from critical business activities – such as merging and acquiring – until it addresses compliance gaps that regulators may find. A bank’s operating charter may even be threatened if its BSA practices are found inadequate. Customer Screening – Sanctions List Match customers against known sanctions lists. There is movement in the industry to use social media, etc. to discover relationships between customers and individuals on Sanctions Lists. 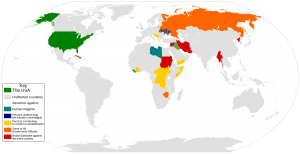 The Office of Foreign Assets Control (OFAC) maintains a list of sanctioned countries, which is typically the starting point for such sanctions screening. Customer Screening – Political Exposure Match customers against known Politically Exposed Persons to ensure they are risk rated and monitored appropriately. Monetary Transaction Monitoring Daily process to proactively screen transactions which fit patterns that could indicate certain types of risky behavior. As an example, a transaction history could indicate that a customer is performing transactions with entities in a medium or high risk foreign country that was not disclosed during customer or account on-boarding. Monetary Instrument Log (MIL) The MIL must indicate cash purchases of monetary instruments, such as money orders, cashier’s checks and traveler’s checks, in value totaling $3,000 to $10,000, inclusive.